The groundhogs have predicted an early end to winter. This can mean only one thing; that your wheels will be calling out to you sooner than later. The St. Albert Bike Association is offering one last set of spin classes to prepare you for the pavement. The class starts on March 9th. and lasts for 10 sessions. Registration details below. Where else but St. Albert’s finest health and fitness facility; the Sturgeon Valley Athletic Club? SVAC has been very eager and generous in their support of this community partnership. This demonstrates their commitment to a healthy and vital community. Login to SVAC’s registration system to register for the program. Depending on your membership status with SABA you will have the option to choose the best value option by paying for the fee along with you membership at once. Paperwork for your membership will be completed during your first class. You can also register in person at SVAC. SABA is bringing back the SPIN. Stay bike fit this winter and feel good that proceeds contribute to promoting a safe and active cycling culture here in St. Albert. Two, ten session classes are being generously hosted at the Sturgeon Valley Athletic Club starting on November 25th and February 17th. These one hour classes start on Wednesday evenings starting at 7:15pm. Space is limited to 18 participants however, personal bikes and trainers are welcome – space permitting. A full class means that SABA can invest more back into St. Albert’s cycling community. Tour of Alberta Family Ride – Join our Team! 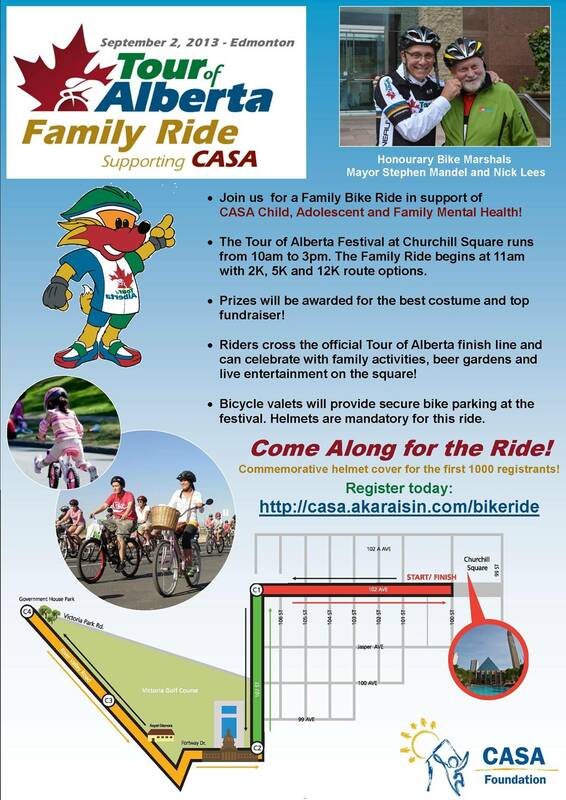 Join us in downtown Edmonton on Monday, September 2, 2013 to celebrate the Tour of Alberta and help raise funds for CASA Child, Adolescent and Family Mental Health! Whether you are looking for a family outing or a team building experience or just an opportunity to get outside and have some fun, this event is for you. Enjoy a leisurely morning of cycle fun geared up for the entire Family. The ride will begin with a mass start at Churchill Square in downtown Edmonton at 11 AM, and will loop back to finish at the starting point – the same finish line our Tour of Alberta teams will ride across the following day! The St. Albert Bike Association is banding together for this scenic ride through downtown Edmonton in support of CASA Child Adolescent and Family Mental Health. You can help us make a difference through our ride by donating to our campaign or by joining our team! The route is a relaxed circuit from Churchill Square to River Valley Road, great for all levels of cyclists to participate. Together, we can change the face of children’s mental health. Come along for the ride!